The famous PPeruvian Miquel was one of the only breeding suri males imported from the Huarapina region of Peru. He won first place at the 2001 AOBA National Show for Suri Get of Sire and has sired many champion offspring. 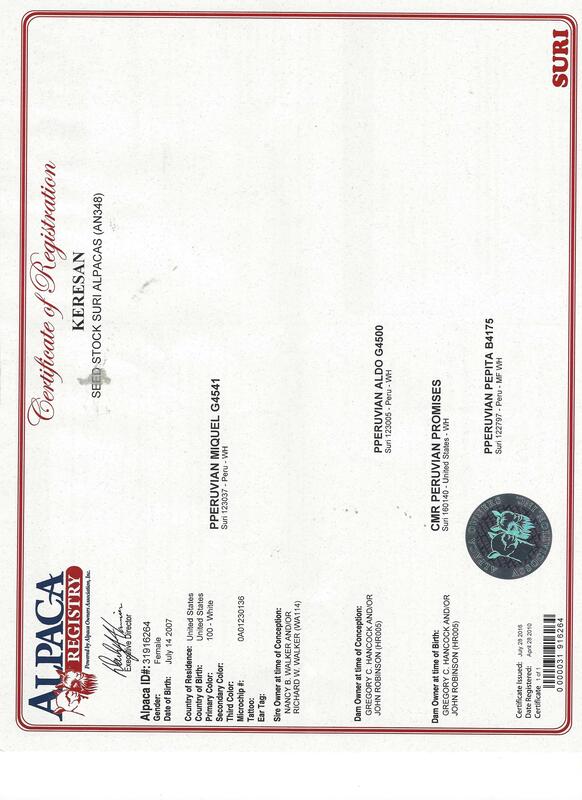 Keresan is the daughter of PPeruvian Miquel and CMR Peruvian Promises and definitely inherited their championship bloodlines. 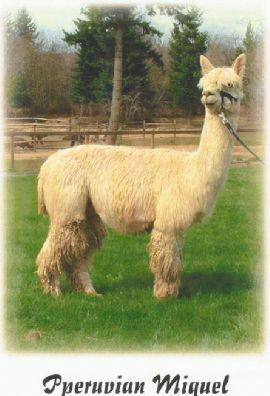 Miquel took first place at the 2001 AOBA National show for Suri Get of Sire and he has produced many champion offspring. Keresan was one of the last Miquel daughters born before his death in 2007. Keresan is a classic full Peruvian with elegant stature and strong conformation. Her fleece is exceptionally fine for her age with bright luster. still 24 AFD at age 11. Keresan has demonstrated she is a super stud female who passes on her great genetics to her offspring. 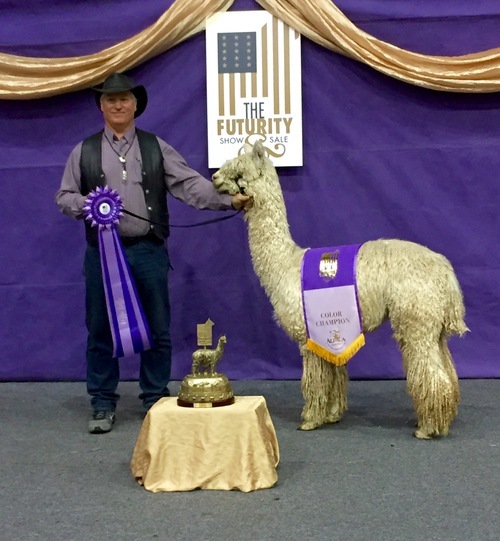 Her first cria, KBTA Kerolyn, a lusterous white female, sired by DDF Accoyo Armani, won first place in halter at Alpacamania 2012. Kerolyn is the dam of multi champion and blue ribbon winner, KBTA KAHUNA'S JOSEPH. Her second cria born in 2012, KBTA's Jacqueline, a beautiful beige female sired by the infamous Helios, took third place at the prestigious CABA Classic show. In 2013, Keresan had a stunning white female out of the famous herd sire, Kahuna. KBTA Kahuna's Princess Georgia has very fine, luxuriously dense fleece. Princess Georgia won ribbons in every show she entered. Keresan gave birth in August 2014 to an awesome white male, Rowen, sired by champion herd sire Kaden, from the famous Torbio and Jackpot bloodlines. Rowen's fleece characteristics are in the top 1% in four EPD categories. Keresan is a Top 5 EPD Trait Leader in the 2013, 2014 and 2015 EPDs. Her highly ranked EPD trait data is strong evidence that she passes thru her positive fleece characteristics to her offspring. At 9 years old, Keresan is retaining her fineness and extremely low % of medullated fibers.